When launching TightVNC remote control, is it possible to display on the remote host an authorization request? If it is, which authentication information can be sent to the remote computer? Is it also possible to define a blacklist of IPs addresses, or to authorize some IPS? Yes, it is possible to manage IPs addresses of computers allowed to connect to a computer, and also to ask the user to authorize or not the remote control. From our software, right click the remote computer, then "Taking remote control", "Configure", "Authorization" tab. You may also directly access to the desired configuration through the "Tools" menu, "TightVNC Settings". If you use version 1.X of the remote control tool, click here. If you use version 2.X of the remote control tool, click here. - Incoming connections from computers which IP address is 192.168.1.10, 192.168.1.11 or 192.168.1.21 are accepted. - Incoming connections from computer which IP address is 192.168.1.20 are submitted to validation from remote computer side (the user can accept ou reject the connection). - All remote control requests will be rejected for computers which IP address is 192.168.2.1, 192.168.2.2, ..., 192.168.2.9. This setting allows to define the security policy to apply on the remote host, regarding incoming connections. A "paranoia degree" is a value ranging from 0 (maximum availability) to 4 (maximum security). This option goes together with the "AuthHosts" setting. The following tables indicates how "QuerySetting" values affect the "AuthHosts" behaviour. By default, the degree of paranoia is defined on value 2 (that means obey "AuthHosts" will be assumed). By supposing we define the degree of paranoia on value 3 (+:Query, ? :Query, -:Reject). Taking our previous example, behaviour regarding incoming connections on the remote host is going to change. Indeed, all the IPs addresses which were previously accepted (defined with "+" in AuthHosts) will be now submitted to validation from remote side (and therefore considered as a "?"). - Incoming connections from computers which IP address is 192.168.1.10, 192.168.1.11 and 192.168.1.21 are submitted to validation from remote computer side (the user can accept ou reject the connection). - Incoming connections from computers which IP address is 192.168.1.20 are submitted to validation from remote computer side (the user can accept ou reject the connection). Another case, if we define the degree of paranoia on the value 3 or 4, and the AuthHosts list is empty. All the incoming connections on the remote computer, from whatever computer which has launched the remote control, will be submitted to validation from remote computer side (the user can accept ou reject the connection). It is possible to define which information will be sent on the remote screen, when authorization is requested. Finally, you may also define the maximum delay (in seconds) to let the user accept or reject your connection request. 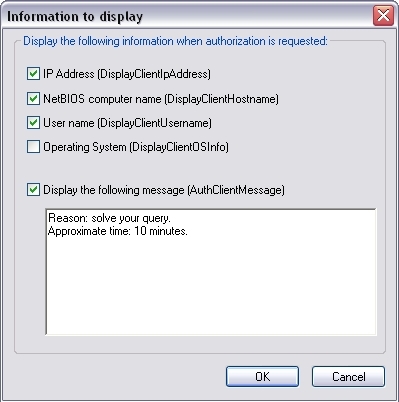 Once this delay has been exceeded and if the user has still not answered (or is not in front of the screen), connection is rejected..
You can create as many configurations as you wish (eg a configuration "Station Config" requiring the acceptance of the connection by the remote user and a configuration "Server Config" which does not require an authorization). Add a TightVNC 2.X configuration then in the "General" tab specify the computers for which this configuration will be automatically used. In the "Authorization" tab enter the IP address of the computers that are behind the request (ie your administrative computers) and choose the action "Query". On the same window click on the "Advanced" button to customize the information that will be sent on the target computer when requesting authorization (eg personalized message, ...). Finally, you can also set the maximum response delay (in seconds) to allow the user to accept or reject your connection request. After this period, if the user has not responded (or is not in front of the screen), the connection is accepted or rejected, depending on your configuration (default action on timeout). You can also "force" the use of a specific TightVNC configuration when taking remote control (right click on the computer then "Remote control with the configuration").